Sneasel in game: 3,958 Who? Important notice! 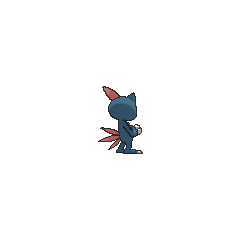 Pokemon Sneasel is a fictional character of humans. 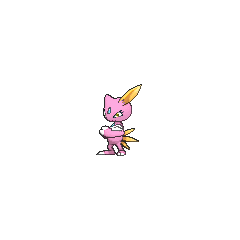 In Pop Goes The Sneasel, this Pokémon was blocking access to the Flame of Ho-Oh. Harrison captured that Sneasel and later used it in the Silver Conference, where it beat Ash's Pikachu, then lost to Ash's Totodile. Sneasel's first appearance was in Celebi: Voice of the Forest. The Iron-Masked Marauder sent this Pokémon along with Scizor to get Celebi. Sneasel also made an appearance in Hail to the Chef under the ownership of Rhoda, a girl that lives outside of Saffron City who was competing with her sister, who owned a Mr. Mime, for the ownership of her father's restaurant. In Duels of the Jungle, a female Sneasel tried to stop a feud between two Weavile. A Sneasel appeared in Sliding Into Seventh! under the ownership of Candice where it battled Ash's Grotle. Multiple Sneasel have appeared in From A to Z!, An Explosive Operation!, and The Right Hero for the Right Job! under the ownership of Team Flare Grunts. A Sneasel was used by one of the students of the Pokémon Trainer's School in Gonna Rule The School!. A Trainer's Sneasel appeared in Off the Unbeaten Path participating in the Pokémon Orienteering. A Performer's Sneasel appeared in Performing with Fiery Charm! participating in the Dendemille Showcase. It reappeared in A Performance Pop Quiz!, Party Dancecapades!, in Master Class is in Session!, where it was used in the Gloire City Master Class Pokémon Showcase, and then again in Performing a Pathway to the Future!, where it was seen watching the same Master Class Pokémon Showcase. Sneasel's most predominant role is as one of Silver's Pokémon which he first appeared in Who Gives a Hoothoot?, probably his first Pokémon as he was the Pokémon he used during his training under the Masked Man, and the only one seen with him in flashbacks of his childhood prior to being kidnapped. He is a dexterous and crafty fighter that fully utilizes his speed and attacks of both the Dark type and the Ice type. After many years, he evolved into a Weavile with his Murkrow in Lance's hidden Whirl Islands chamber. Additionally, wild Sneasel are shown in both the Icefall Cave and near Snowpoint City, some of them being cared by Candice. 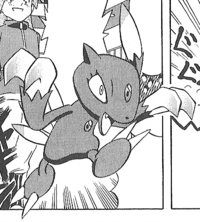 Sneasel scales trees by punching its hooked claws into bark. It seeks out unguarded nests and steals Eggs for food while its parents are away. 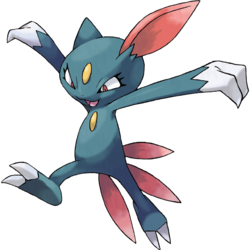 Sneasel has the highest base Speed of all Pokémon that can evolve. In Pokémon Gold and Silver, Sneasel's skin was brown and it had turquoise feathers. This was rectified to match the original artwork in Crystal. 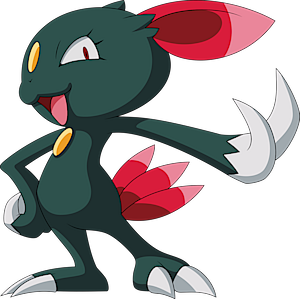 Sneasel appears to be based on the kamaitachi, weasel demons with sickles on their front legs. Its Ice typing may also be a nod to the kamaitachi's association with ice and snow. It also shares similar traits with cats and weasels, from unusually cruel behaviors to even superstition, from cat demons or black cats of Western witchcraft, to Japanese superstition of weasels, being known in their respective cultures for being sneaky and associated with "evil" and misfortune. Its eye markings are similar to that of ones in Egyptian style, possibly Horus's.